Terrariums are relatively simple in nature, and therefore are ideal project for children. They are a great way for children to learn how to care for plants and develop an understanding of and appreciation for raising living things. They are generally hardy and resilient, so do not be hesitant to give ownership of the terrarium to your child. There are some things you should have in mind when creating your kids' terrarium. First, think about the types of plants you want in the terrarium. In general, the hardiest variety of terrarium plants are cacti, followed by succulents. For the absolute beginner, the best option is probably moss. After you have selected the plants for the terrarium, let your children help select the base materials that you will plant them in. For a more playful option, use colored sand and rocks. Choose materials that complement your choice in plants, perhaps with varying size and texture. 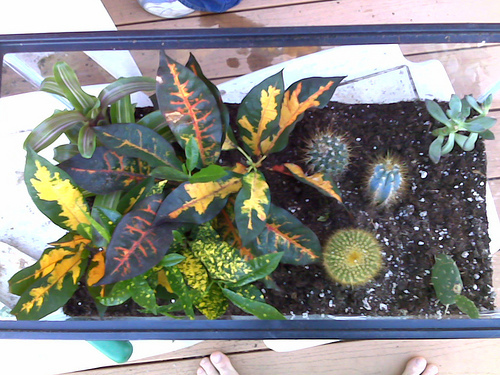 By mixing the materials used in the terrarium, it will be more visually appealing to your kids. Since you're adding flair by using colorful and exciting base materials, try placing some of your child's favorite toys in their terrarium. Some miniature toys can add more visual appeal to the plants and animals in your container. Why not add some Matchbox cars or green army men? Finally, many kids will be delighted to have an animal that lives in their terrarium. Many pets are well adapted to life in a terrarium. 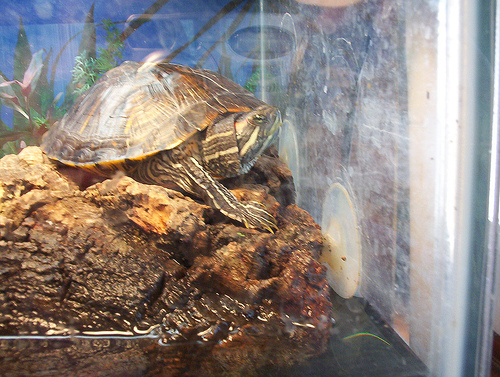 Reptiles like turtles, newts, salamanders and other small lizards are all able to thrive in a terrarium. Be aware that caring for a live animal is naturally a larger responsibility than if your container only has plants in it. Having a creature also means that your terrarium will be bigger and more complex. For example, most of the lizards need a place to bask, and also a place to hide. Some need a light or heat source. Make sure your child is able to properly care for a small creature before adding one to your terrarium.